NEW YORK/MEXICO CITY(Reuters) - The new North American trade agreement ends key legal protections for many U.S. businesses operating in Mexico, leaving their operations exposed to a risk they had avoided under the old trade deal: Mexico's court system. 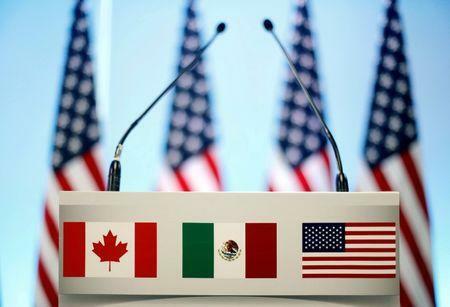 A change in Mexican or Canadian regulations, for example, that had a material impact on a U.S. firm's operations, could be challenged through an international panel instead of local courts. The removal of the investment protection means firms would now be at the mercy of Mexico's courts, which are notorious for corruption, an energy industry source said. A spokeswoman for USTR declined to comment for this story, referring to Lighthizer's previous statements, which essentially said the old provision encouraged companies to move operations overseas at the cost of American jobs. Trump blamed NAFTA for the loss of thousands of U.S. manufacturing jobs to Mexico, where labour is cheaper. He threatened to end the free trade deal until Mexico and Canada agreed to more favourable terms. A revised pact was signed last month. "He took a more moderate position because Mexico wanted to preserve ISDS, because it is very important for investment," said Jesus Seade, lead trade negotiator for Mexico President-elect Andrés Manuel Lopez Obrador. Republican lawmakers in the United States, including Senator Orrin Hatch from Utah, also opposed Lighthizer's attempts to cut ISDS from the deal. He led other lawmakers to press Lighthizer to keep NAFTA's "robust investor protections" in a March letter. A spokeswoman for Hatch said he is still reviewing the deal and working to ensure it "will build on NAFTA's proven success". "This is a major degradation of investor protections," a business industry source in Washington said. In 2009, agribusiness Cargill Inc won $77 million (59 million pounds) from the arbitration tribunal over trade barriers the company said Mexico erected against high-fructose corn syrup from 2002 to 2007. In 2015, Ottawa was forced to pay ExxonMobil Corp <XOM.N> and Murphy Oil Corp <MUR.N> $17 million in damages after the companies won a victory against a requirement to spend money on research and development. "The change to ISDS is certainly deliberate and signals what USTR will pursue in the future," said Inu Manak, a trade specialist at the Cato Institute, a conservative think tank in Washington. "We'll have to see how far they push it in the coming year as more negotiations begin," Manak said.